If you use Amazon Cloud Player, you might have noticed that it has a limit of 10 PCs or devices you can use it on. Since the Cloud Player app is available on virtually every tech device – computers, Roku, smartphones…etc. You might already be at or near the limit. Usually it’s older devices that you no longer have or use. So here’s a look at how to remove them. 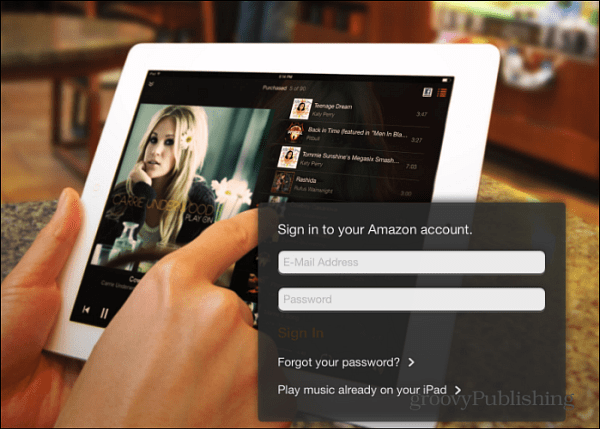 A device is authorized when you download Amazon Cloud Player app to your smartphone, tablet, or PC and log into your account. 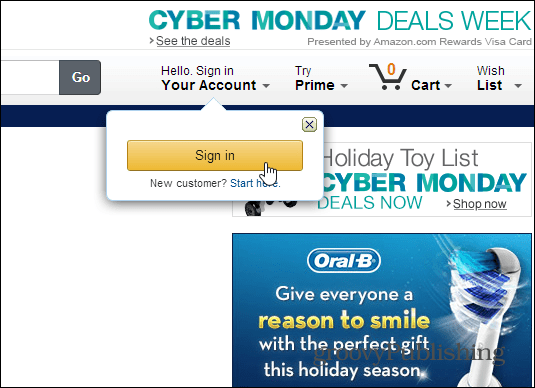 To deauthorize devices you no longer need, sign in to your Amazon account. Then on the Your Account page scroll down to the Digital Content section and select Your Amazon MP3 Settings. 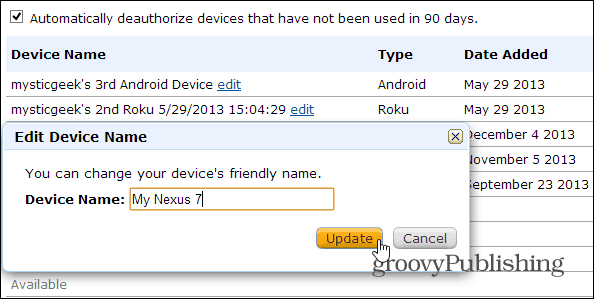 Now you can go through all of your devices that are authorized and deauthorize the ones you no longer need. You might also want to check the box next to: Automatically deauthorize devices that have not been used used in 90 days. That should allow you to keep from having to go in and deauthorize devices too often. Remember this isn’t just for Kindle devices, it’s for any computer or device you have the app installed on. You’ll notice that Amazon gives your devices generic names by default – which makes them hard to tell apart. But you can change each device to whatever name you want. Also, like Apple allows, you can deauthorize all devices in one shot – this option is only allowed once a year though. 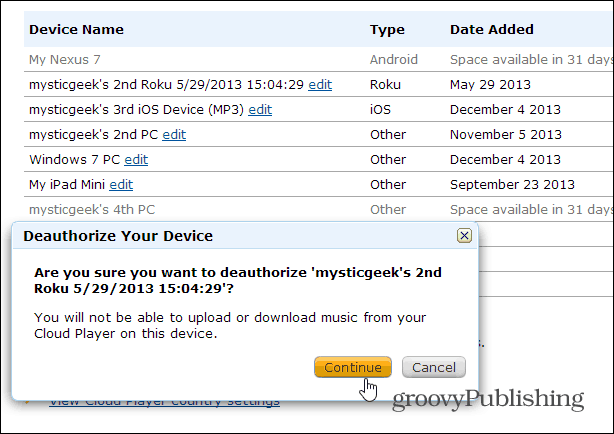 Up to 10 devices can be authorized to your Cloud Player account. Only one account can be authorized to a device at a time. Any computer that you download music to or import music from using Cloud Player requires authorization. When you deauthorize a device, it takes 30 days for that space to become available. Amazon is generous and allows 10 devices, so you shouldn’t run into not enough slots unless you’re a tech junkie and have a bunch of devices. But if you are, and need the slots for devices, it’s a good idea to periodically deauthorize the ones you don’t need. Thanks Brian – just what I needed today! If I de authorize all devices at once, do I still have the 30 day wait before being able to authorize my current devices?